← MumbleGate! BBC’s Jamaica Inn and the Case of the Mumbling Thespians! Okay, I know I’ve already said this in a previous blog post but…Colin “Firthianados” get ready to see your man kick some major ARSE in the 20th Century Fox release of Kingsman: The Secret Service! I’m all in a Firth-induced frenzy over the release of the OFFICIAL TRAILER for what will be Colin Firth’s action movie debut! We saw a ‘sneaky peek’ of The Secret Service back in March at CinemaCon and I’m pretty sure I wasn’t the only one in the audience screaming when Colin pulled out his John Steed-esque umbrella and started taking out a group of thugs in a pub. Or, maybe I was. No matter, by the end of the clip the audience broke out in thunderous applause. This was Colin like we’d never seen him before! James Bond NEVER looked this good! If fans ever pined to see Firth play James Bond…here’s your chance to see him in full secret-agent glory! Kingsman: The Secret Service, based on the comic book by Mark Millar, has Firth playing a highly-trained, sauve British spy, Jack London, who attempts to save his street smart nephew, played by Taron Egerton, from falling into a bad crowd by taking him under his wing. In a major tip of the ‘bowler’ to 60’s spy films, director Matthew Vaughn says, “We missed all the spy movies we loved as kids, whether it was Bond or ‘In Like Flint.’ They had a sense of humor as well as being a thriller,” He says the idea for Kingsman was dreamed up over a “few drunken conversations, with Millar, at the pub.” And thank GOD for that extra little pint that gave him the inspiration to cast Firth in the role of the British spy! James Bond meets John Steed…I can’t wait! 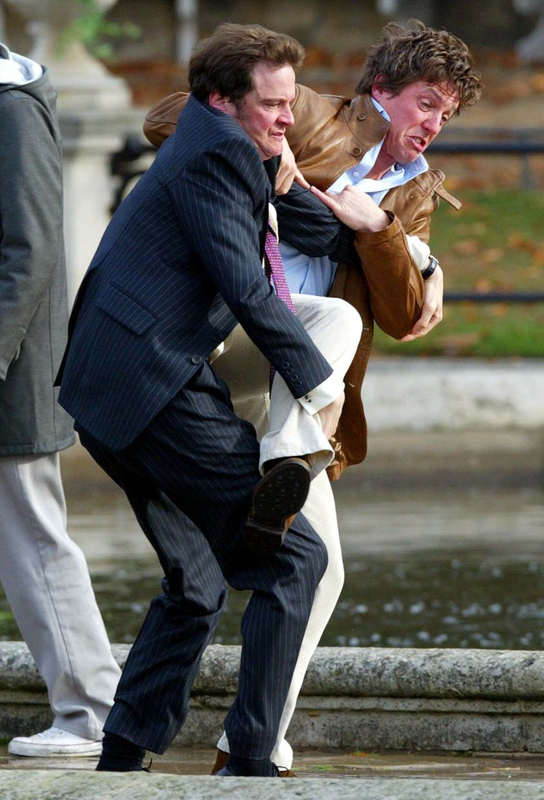 Um, I’m sorry…apparently Vaughn didn’t see Colin kicking the crap outta bad-boy Hugh Grant in BOTH Bridget Jones’s Diary movies! He looks pretty fearsome to me…. Colin also said that Vaughn told him, “You’re going to have to do it. Are you up to it?” That’s one of the reasons he got me so early, to start training. He said, “You’re going to hate me by the end of it,” and sure enough, the Jackie Chan training team comes to my house and they get to work on me. I don’t think I’ve ever enjoyed myself so much in my life. I realized that I’d made assumptions about myself that meant I had probably been neglecting something that I might have enjoyed for years if I’d got to it earlier. Looking sleek and ready to kick some arse! The clip that was shown at CinemaCon, (which I hope they eventually release as a trailer), shows a familiarly dashing Firth, sitting down over a pint at a pub and having a calm intelligent conversation with his ‘tude-filled’ nephew, who he is trying to set straight, when a dangerous-looking group of thugs walk in to confront the kid. They ask “grandpa” to leave before he gets hurt and THAT is when we see Firth go into action like you’ve NEVER seen him before, using every Bond-esque move to kick the living daylights out of these punks! I hope they keep this in the film. The film also stars Michael Caine, Samuel L. Jackson and something for the tween/teen set in the form of British newcomer Egerton. Somebody get me my smelling salts! 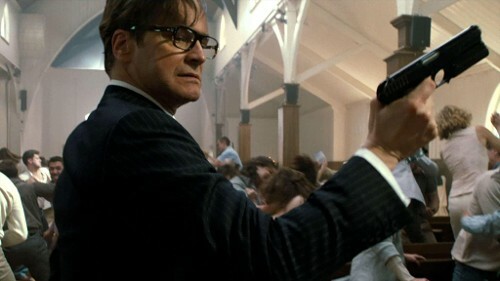 I want to KISS Vaughn for offering Firth this role!….However, I always knew he had it in him! This entry was posted in Home Page Posts, Lady Anglophile Reviews & Other Bits and Bobs and tagged 20th Century Fox, Bridget Jones's Diary, Colin Firth, Kingsman: The Secret Service, The Secret Service. Bookmark the permalink. 2 Responses to Colin Firth is Going to Kick ARSE in Kingsman: The Secret Service! I also know mezitang will help me in my vocation aspirations…. Rigidity form lidasale training refers to extra traditional significant lidasale teaching. Lower repetitions with for a longer period relaxation intervals: this may well be sets of 5-8 repetitions with 1.5-3 minutes rest in between sets or what have you. Just your inventory regular common form of hefty lidasale function.